I’m in vacation withdrawal. I know I’ve been home for like… 3 days; however, it’s still lingering over me! California was awesome! I’m daydreaming about working at Stanford, or Condé Nast, or *gasp* GOOGLE. Big dreams, I know. I’ve only ever half considered moving to California (SO many people! Yikes! ), but after this last trip… I’d be all about it. It’s beautiful. The weather is gorgeous. The people are friendly, intelligent, interesting, creative — the list could go on. I almost expect to be chastised for admitting my Cali-love because of my Oregon roots, so let me be clear: I’d go back to Portland in a heartbeat, and to California in a few more heartbeats than that. So while I spend my time day dreaming about California living, I’m actually working hard up here both at work, at running, and at cooking. I’ve been slacking a bit and therefore don’t have four weeks of recipes stockpiled anymore — how did this happen!? This recipe was Derek’s “creation” — meaning he thought it up and requested it. I thought it sounded quite good myself, so I hopped on that train and chugged away at making it happen! This recipe takes a bit of planning – you have to cook the brownies enough in advance to let them cool completely (and then even freeze them, if you want easier cutting!). The amount of cheesecake batter is less than usual, due to the (duh) space taken up by brownie chunks! 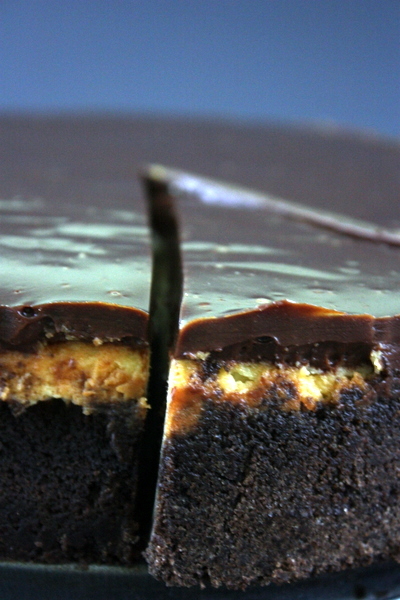 The BEST part about this recipe (besides the chocolate graham cracker crust and the brownies and the cheesecake) is the chocolate caramel ganache! Holy sauce! I did plenty of finger licking during the process of assembling this sucker! It’s delicious. No joke. If you have extra, cool it off and spread it on your toast. Or dip your crackers in it. Or just get a spoon. 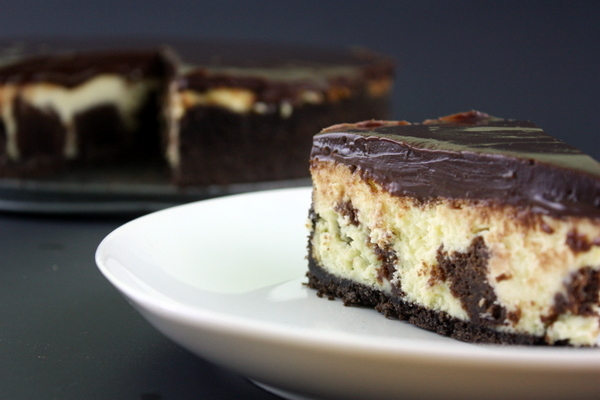 The holy trinity of desserts, this recipe combines cheesecake, brownies, and dark chocolate ganache into a combination that will cure any ailment. Preheat the oven to 325 F. Line an 8×8 baking dish with foil, then butter the foil. Combine flour, salt, and baking powder in a small bowl. Set aside. Melt butter and chocolate together in a saucepan over medium heat, stirring frequently to avoid burning the bottom. When the mixture is fully melted and incorporated, remove from heat and stir in vanilla and sugar. Add eggs, one at a time, and mix to fully incorporate. Add flour mixture and stir until just combined. Pour into the prepared pan and smooth top. Pour the cream cheese layer over the brownie layer, then drizzle the caramel as you wish. Bake for 40-45 minutes, or until a cake tester comes out mostly clean – these brownies are not cakey at all, so they will still be somewhat dense and gooey. Remove pull the brownies out with the foil, and cool completely. For an easier time cutting them up, stick them in the fridge (or even freezer!) to really solidify them. When they’re fully chilled, cut them into cubes no larger than 1″ across. I opted for 1/2″ cubes. Preheat the oven to 375 F. Butter a 9×3 round spring form pan. In a food processor, pulse the graham crackers, sugar, and salt, until finely ground. Add melted butter and pulse until combined. Press into the bottom of the buttered pan, and up the sides one inch. 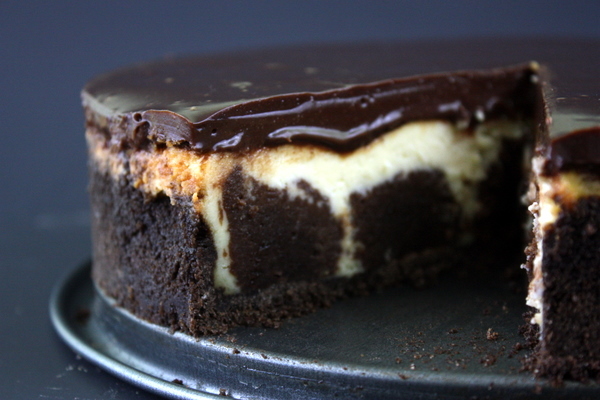 Bake for 12-14 minutes, then let cool while you’re making the cheesecake filling. In a large mixing bowl, cream the cream cheese and sour cream until smooth. Add sugar, then eggs, one at a time. Mix in vanilla. Arrange the brownie cubes in the prepared crust so that they have between 1/4 and 1/2 inch between each piece. Pour the cheesecake batter over the brownies in the crust and smooth the top. Bake at 325 F for an hour and twenty minutes, or until the cake is mostly set and still jiggly in the middle. Remove from the oven and allow to cool completely. Prepare the ganache when the cheesecake is completely cooled. Grate chocolate in a food processor until very fine. In a small pan, combine the sugar and water. Stir, over medium heat, until the sugar has completely dissolved. STOP STIRRING and allow the mixture to bubble until it is a deep amber color, or your candy thermometer is close to 370 F. Remove from the heat and, while stirring, add the cream. This will bubble furiously – KEEP STIRRING! Return to low heat and stir until the mixture is 100% smooth. Stir in the butter. Pour the caramel mixture into a vessel with a pouring spout. With the food processor running (with the chocolate in it), gradually pour the caramel mixture in. By the time you’re done pouring, it should all be smooth and chocolatey! If your cheesecake has a very uneven surface, trim it with a warm knife to flatten the top before pouring the prepared ganache over the top. 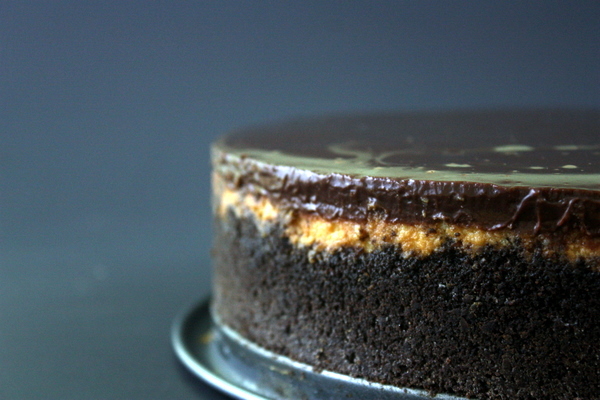 Allow the ganache to cool several hours on the cheesecake before serving. Use room temperature ingredients! Seriously, it will make everything better. In the initial mixing of the sugar and cream cheese, mix longer than you ever imagined necessary. It will seem smooth, then get smoother, and smoother: keep going. Scrape the sides of the bowl with a rubber spatula to ensure everything is getting mixed, and mix until you see absolutely no clumps and it is the most beautiful smooth sea of cream cheese you’ve ever seen. Use a water bath! I’m a huge proponent of water baths for cheesecakes: find a dish big enough to fit your spring-form pan into, and fill it with about an inch of boiling water when you start baking the cheesecake. This will regulate the temperature better and humidify your oven to ensure a more uniform baking, as well as prevent cracks from forming in the top of the cheesecake. Let this cheesecake sit overnight. Let any cheesecake sit overnight: it will taste SO MUCH BETTER in the morning! I’m not kidding – just do it. For the easiest cutting of the cheesecake, have a bowl of hot water next to you as you cut the cheesecake. Before each cut, dip your knife into the hot water and then flick off any extra water, but do not dry it with a towel: it will only make it significantly more difficult to cut. EXACTLY! It definitely was not a *light* dessert… but absolutely worth it! This really look incredible! Love the combination of flavors here. I'm thinking of adding a touch of orange flavor to the ganache when I make this. 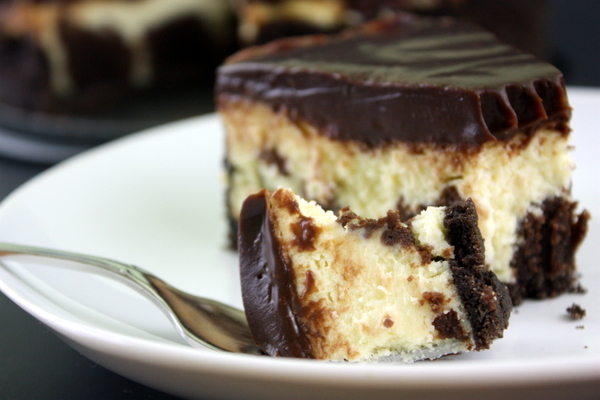 I was wondering, I make brownies with cheesecake on top and cook them at the same time , would that work here? When I make cheesecake I put a pan of water on the rack below my cheesecake rather then putting my springform pan into a water bath. I have nightmares from stories about the water leaking into the pan and ruining the cheesecake so I have never tried that. Is there a way to guarantee that never happens? I have never had a cheesecake crack but better to be safe then sorry. Thank you so much for this blog. I love finding new recipes and trying them out. Great questions – I considered cooking the brownies and the cheesecake at the same time: I think it probably would work! That said, I really have no clue. Let me know if you try it like that!! I sometimes to a pan of water, instead of the bath, and it works just fine. The water bath isn't too scary as long as you really are careful about double wrapping with foil! I've never had a problem with leakage. Thanks for reading – let me know how it goes!